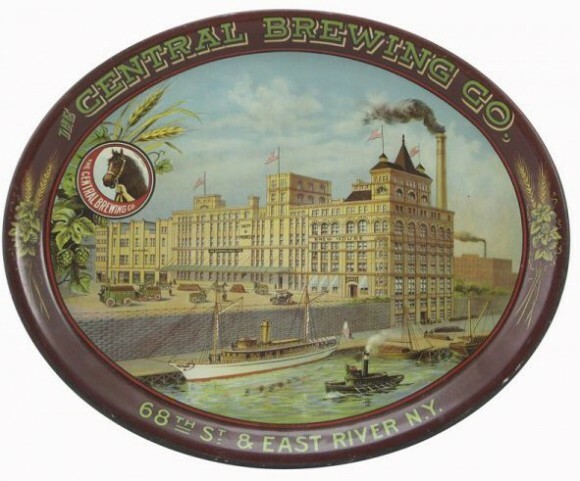 This tray for the Central Brewing Co. shows an image of the Brewery at 68th St & East River N.Y. The architectural detail shown on the Brewery is quite nice and the activity of ships and early automobiles, and the vivid blue of the water and sky provide great contrast with the brown rim. This tray dates from 1903-1914, and is an oval 17″ x 14″. The value of this tray can be over $1000 for examples in great condition so please get in contact with us for an offer or appraisal.